Continued thanks to the publisher, especially for the ALC of ‘A Time of Dread’ in exchange for an honest review. I would also like to personally thank John Gwynne for this phenomenal story he has given us. Lastly, Damian Lynch, a name I was very unfamiliar with but has quite a library to his name (including Mike Carey’s ‘Felix Caster’ series), killed the narration and I look forward to his (hopeful) return to the series. I need to preface my review by saying this: I have only read one other book by Gwynne and that was Malice (The Faithful and the Fallen, #1), which I finished earlier this year. I read it mostly out of anticipation for this novel, which had an immense amount of hype surrounding it, and rightly so. While AToD takes place around 120 years in the future, after the events of The Faithful and the Fallen series, I didn’t feel like I had missed out on a ton while not having finished the first series. Though it would have been nice to have seen the concluding events from Wrath (The Faithful and the Fallen, #4) to see just how we got to this point, Gwynne manages to fully capture the Banished Lands for new and old readers alike and delivers another truly epic beginning to a series. There are also subtle flashbacks and stories that will either give old readers the feels or new readers a glimpse into the past. The Ben-Elim, the race of warrior angels that crushed the Kadoshim, now hold dominion over the Banished Lands. In their strong-hold, Drassil, with peace seemingly restored and with their foe having been defeated – its leader, Asroth, frozen in metal and kept under constant guard – some within have plans of their own and the enemy may be closer than they thought. Asroth’s faithful stay hidden in the shadows, gathering more servants to replenish the horde before returning for their master. Moans and screams are twisted between the trees of the dense forests, demonic creatures being crafted from meat and bones of the innocents caught straying away from the path. Caught in the middle are two young individuals, Riv (in the South) and Drem (in the North), that carry with them information that could change the Banished Lands forever. But will they be able to find help in time before another war is started? Though there are similarities to Malice, AToD serves up darker and more sinister undertones than its predecessors. One way you can tell before even cracking the book open is taking a gander at the cover. While the TFatF series of books were all white covers, AToD is set on a black background (not quite sure if this was planned, but it sure worked). The Faithful and the Fallen series shows true distinction between who is good and who is evil, this time around the lines are little more skewed and painted a darker shade of grey. There are also fewer characters to keep up with this time around as the focus is on only four (4) POVs and their impact on the Banished Lands. These characters are all-new, so perfect for new readers, but fans of Gwynne’s will rejoice with the re-introduction of a few characters from his previous series. 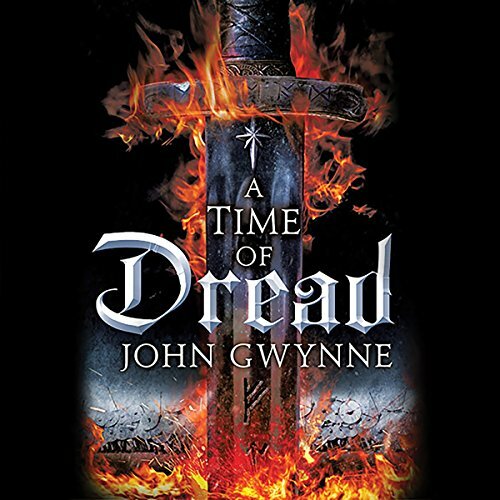 I believe that our four (4) main characters all bring something new to the table and each one of them created a deep engagement with me as the reader, which just goes to show how great Gwynne’s characterizations are. You’ll laugh with, cry for, become frustrated with, and root for each of them, and that is why John is one of the best in the business. Again, even if you have never read The Faithful and the Fallen, if you are a fan of epic fantasy, A Time of Dread needs to be on your wish-list. I will also state that this is not grimdark, in case that is an instant turn off for some readers. While it does portray a great evil and the Banished Lands have an overarching sense of dread, our characters are inherently good and do have redeeming qualities It is full of intense fight scenes, dramatic plot twists, rich world-building, and characters that demand your attention. It absolutely has the makings of an excellent series and I cannot wait to see the journey Gwynne takes us on. Purchase A Time of Dread on Amazon or other preferred retailer.